Musical influences: Chappotin, Fats Navarro, Miles Davis, Manuel Guajiro Miribal, Quiny Jones, too may to list. Key teaching concepts: Control, Concept, Effortless playing. Mario Silva is one of the most widely-known trumpet players in the San Francisco Bay Area, in addition to being one of the longest standing instructors at Music Time Academy (on staff since 2008). We also extremely excited for and proud of Mario, the first (but not last!) ever Grammy-winning Music Time Academy instructor, who was honored for his work on “Strictly Roots” by Morgan Heritage, which received Best Reggae Album of the Year in 2016. 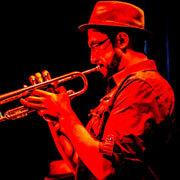 As a professional musician since the age of 19 (only 3 years after he began playing the trumpet), Mario has performed throughout the United States and the world. An exceptionally diverse musician, Mario does not specialize in any one genre. He can be heard with ensembles playing everything from Reggae to Salsa to Jazz to Classical to Hip Hop…and beyond. Not only a performer, Mario is both an avid student and teacher of music. In well over a decade of teaching, he has worked with hundreds of students here at Music Time Academy as well as at other schools and institutions. Mario enrolled as a graduate student at Cal State East Bay last year, after having completed a Bachelor’s Degree in Jazz Studies from San Francisco State years ago. Passionate about passing on knowledge to young musicians, Mario has helped many of his students reach first chair in school band, win awards and competitions, and even be featured in local news media (see article about Gabriel). Lessons with Mario are available in both English and Spanish.